Yin and yang is a philosophy that describes how contrary forces are actually complementary and may be mixed to create a higher order end state or place to be. When this is achieved in the creation of a home, it can be said that true luxury lives inside. Because when the bold, strong, masculine world of modernism meets soft, fluid, feminine shapes, features and textures; the result is greater than the sum of the parts and an exceptional, one of a kind lifestyle emerges. That’s the purpose of the luxury brand Casa Clara founded by a visionary husband and wife team. From the start, Casa Clara was designed to create a genuine luxury lifestyle” says principal architect Ralph Choeff. 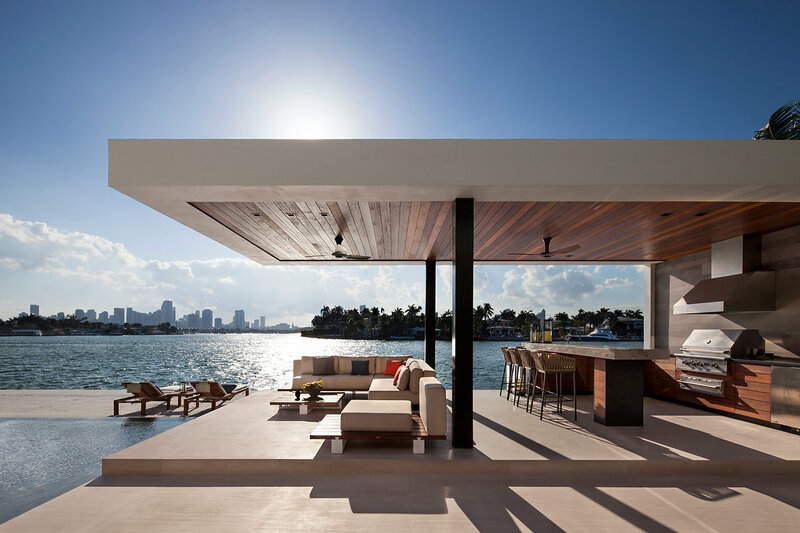 “An ideal double lot was utilized to provide a horizontal layout and thereby an optimal relationship with the water and incomparable views to create the quintessential tropical modern estate with an exquisite indoor – outdoor living experience.” At 11,500 square feet this home has an incredible impact and stopping power. “A modern house of this size could read as a museum” the owner says. “Not here. Not us.” His wife and co-owner agrees: “this is a tropical, modern home. It’s a blend of modern design and materials that soften the strong shapes to create warmth”. To create their ideal interior, the owners worked with the Charlotte Dunagan Design Group. The brief was to “create a luxurious space that combines contemporary aesthetics with a tranquil inviting atmosphere”. Says Charlotte: “I loved taking the challenge of designing a very large scale modern home and making it feel like a warm, intimate and cozy space.” Ceiling heights and rooms are enormous, yet the home feels snug. Even though it is modern and sleek, a host of textures are blended to create warmth. Creamy limestone flooring from Portugal meet dark woods of many exotic varieties. Stone countertops by Boffi and a spectacular floor to ceiling metal and stone fireplace combine to add drama and excitement. This luxurious home is a private, intimate world where the master suite has its own den, living area and even staircase. “In true Casa Clara style the design of the home is based on warmth and comfort” the owner says. “We chose a palette of earthy tones and you see them repeated because we wanted them to read as both interior and exterior elements of the design”, agrees both Charlotte Dungan and the owner. Further by using the same luxury brands of furnishings throughout, each room is unique yet the home is unified. Luxury lives in the finer detail. This is a place where passion and perfection collide. Exquisite living lives here. That vision comes together on the Venetian Islands of Miami Beach. “For us this isn’t just a magnificent home” the owner says. “It’s a lifestyle”. A lifestyle that’s perfect for entertaining both indoors and out—one that fuses seamlessly. 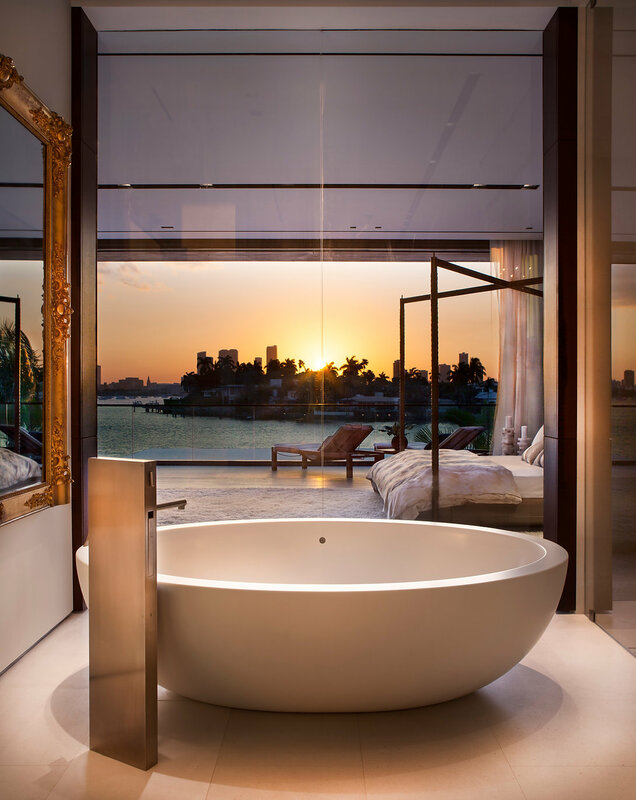 Here we see the most extraordinary views of beautiful Miami Beach. Now let’s back up all the way to the entrance of this Casa Clara masterpiece where contrasts creatively come together. The front exterior is boldly modern with clean, tall, straight lines, distinct right angles, geometric shapes and white walls. However, the enormous front door is crafted from beautiful European oak that drips with character. And then while walking toward the door is a stunning 40 foot waterfall, made from a deep, gray Montpelier stone, that will take your breath away and bring your every sense to life. Once you step inside, you are welcomed into one of the most wonderful worlds in the Western hemisphere.